Meniere’s disease is a disorder of vestibular labyrinth characterized by triad of paroxysmal vertigo, deafness & tinnitus due to increased volume & pressure of endolymph. In brief: - Endolymphatic hydrops with attacks of low frequency SNHL, tinnitus, vertigo and sensation of ear fullness. - In between attacks the patient is usually symptom free. However, the patient may present later with progressive SNHL that is detectable by audiogram even in absence of the attack. - There’s no specific test to confirm the diagnosis. It’s usually based on the clinical findings, audiogram findings and electrocochleogram to confirm the hydrops. - Medical treatment is the usual role. Surgery is very rarely needed and is mainly about endolymphatic sac decompression +/- shunting. Various infections eg, otosyphilis and Cogan’s syndrome [interstitial keratitis]. Autoimmune diseases, such as lupus and rheumatoid arthritis, may cause an inflammatory response within the labyrinth. An autoimmune etiology was postulated after there was found to be an association with the presence of thyroid autoantibodies in patients with Meniere’s disease. In addition, allergy has been implicated in many patients with difficult-to-treat Meniere’s disease. Food triggers are also important factors in the generation of hydrops. Meniere’s disease appears to be more common in females than in males. Meniere’s disease can be seen at almost all ages, but it usually starts between the ages of 20 and 50. The female predilection of Meniere’s disease is shared with migraine headache and, in fact, there is a growing body of evidence that Meniere’s disease and migraine headache may be related and/or different spectrums of the same disease. Ménière disease is defined as “recurrent, spontaneous episodic vertigo; hearing loss; aural fullness; and tinnitus. Either tinnitus or aural fullness (or both) must be present on the affected side to make the diagnosis. Vertigo is a subjective sensation of motion while motionless. Horizontal or rotatory nystagmus is always present during vertiginous attacks. The vertiginous attacks may last from minutes to hours and often are associated with severe nausea and vomiting. At least 2 definitive episodes of vertigo of at least 20 minutes duration must have occurred to make the diagnosis. In 10% of patients with the symptom of vertigo, Ménière disease is the cause. Between episodes, some patients are completely symptom free. 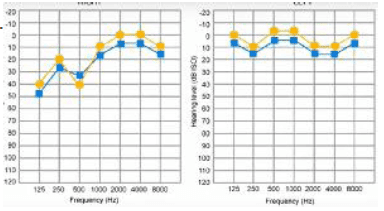 Many notice progressive deterioration of hearing and balance function with each successive attack. 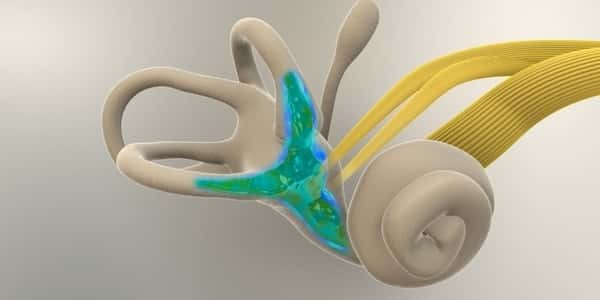 -Sensorineural hearing loss must be documented audiometrically in the affected ear at least once during the course of the disease. There may be fluctuation in the degree of hearing loss superimposed on a gradual decrement in function. 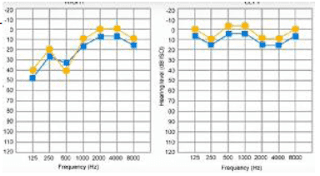 -The hearing loss primarily affects low frequencies. - Tinnitus is often nonpulsatile and may be described as whistling, although the classic description is that of low-tone, ocean-like roaring. - It may be continuous or intermittent, usually corresponding to the loss of hearing during the attack. In 50%: ear fullness, otalgia & increase tinnitus. 1- PTA: SNHL (see above). 2- Speech audiogram: poor discrimination matching PTA. 4- Dehydration (Glycerol) test: during the attack PTA >> 1.5 mg/kg glycerin + equal saline >> PTA after 3h. : if improved by 10-15 dB (+ve). 5- Caloric test: hypoactive labyrinth (canal paresis). 6- CT to exclude retrocochlear pathology. Medical therapy can be directed toward treatment of the actual symptoms of the acute attack or directed toward prophylactic prevention of the attacks. Most care in the emergency department (ED) is based on symptomatic relief of the clinical findings. -Intravenous (IV) or intramuscular (IM) diazepam provides excellent vestibular suppression and antinausea effects. -Steroids can be given for anti-inflammatory effects in the inner ear. -IV fluid support can help prevent dehydration and replaces electrolytes. -During the quiescent phase, medical treatment of Ménière disease is tailored to each patient. Lifestyle and dietary changes are usually the first step. Avoiding trigger substances (eg, salt, chocolate, caffeine) alone may be sufficient. Smoking cessation also is recommended. If medications are required, a 3-month trial of a diuretic (eg, hydrochlorothiazide/triamterene) and dietary management are prescribed. -Rehabilitation: If the patient has balance problems between episodes of vertigo, vestibular rehabilitation therapy might improve the balance. -Hearing aid: A hearing aid in the ear affected by Meniere's disease might improve the hearing. Doctor can refer patient to an audiologist to discuss what hearing aid options that would be best for him. -Meniett device: For vertigo that's hard to treat, this therapy involves applying pressure to the middle ear to improve fluid exchange. A device called a Meniett pulse generator applies pulses of pressure to the ear canal through a ventilation tube. -Intratympanic injection of selective vestibulotoxic drugs. -Endolymphatic sac decompression (Saccus decompression). -Selective section of vestibular nerve. B) Bad (non serviceable) hearing. - Surgical labyrinthectomy (not done).